In 2018, Naugatuck received $16 a ton for recyclables. This year, the borough won’t receive any money or pay any money to dispose of recyclables. Naugatuck is one of the lucky municipalities. For years, municipalities have received tens of thousands of dollars annually for recycled materials collected from households or at least had the materials collected for free. Many of these bottles, newspapers, cans and other materials found their way onto container ships bound for China. But China has largely slammed the door on American recyclable material, cutting the industry off from a big chunk of its former market. China’s new policy, launched last year, comes in response to a large amount of non-recyclable material in loads from America. China’s rapidly growing economy has also produced enough recyclable consumer waste to fill the void. Naugatuck, which uses the Materials Innovation and Recycling Authority, or MIRA, for its garbage and recycling disposal will see its tipping fee, or disposal fee, for trash increase. While the borough isn’t paying anything for recyclables, its tipping fee for trash is set to increase $11 to $83 a ton by July. Naugatuck Public Works Director James Stewart said he put an additional $90,000 in the public works department’s 2019-20 budget request due to the increase. According to Thomas Gaffey, director of recycling for MIRA, the company will only offer no tipping fee for recyclables for municipalities with a “long-term tier 1” contract. Municipalities that do not have a contract with the company will pay $30 a ton to dispose of recyclables, Gaffey said. Stewart said the borough looked at other options but couldn’t find a better price. Beacon Falls, which contracts with Oak Ridge Waste and Recycling for its collections, will see a significant increase in its tipping fee cost. Beacon Falls Finance Assistant Erin Schwarz said the town previously wasn’t charged to dispose of recyclables and received a rebate of about $7.50 per ton. Starting in July, the town will pay $65 per ton for recycling and $69 per ton for trash disposal, she said. Last year, the town had about 1,400 tons of trash and 485 tons of recycling, Schwarz said. Beacon Falls First Selectman Christopher Bielik said officials explored other options that would have charged much more for garbage disposal but nothing for recyclables. Since the town disposes of much more garbage than recycling, he said it made financial sense to stay with Oak Ridge. “Everyone’s in the same boat because the market for the recyclables that existed previously no longer exists,” Bielik said. 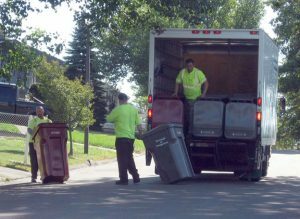 Schwarz said the increased cost to recycle may give people less incentive to recycle. Prospect Mayor Robert Chatfield said the town has been bringing its recyclables to the Bristol Resource Recovery for years and hasn’t paid anything for recycling disposal. The Bristol Resource Recovery is working to solidify what it will charge in the coming fiscal year, Chatfield said. Chatfield said he expects the final number to be in by the end of April, but has already put $70,000 in the 2019-20 budget in preparation. If the overall cost comes to more than that, Chatfield said he would take the money from the general fund. However, he believes it won’t come to that. Elio Gugliotti and the Republican-American contributed to this article. I forgot composting! That’s also a great individual action people can take to reduce the amount of trash going to landfills and save $. The loss of a market for recycled goods is a significant issue for municipalities across the US. We need to reduce our use of single use items overall – bring your own water bottle and coffee cup, consider buying food in bulk, etc. Although recycling now costs Beacon Falls $, its still a bit less per ton than trash disposal. If we recycle what we can and especially reuse items/reduce our purchase of single use items – we can save money and help keep our environment healthy. Why wouldn’t Stewart wait also to see what Bristol Resource Recovery charges before hiding 90 mil of Naug. taxpayers money? Always follow Prospects lead…. They don’t, and never will suffer from a 49 mill rate like the oppressed Naugatuck home owners.